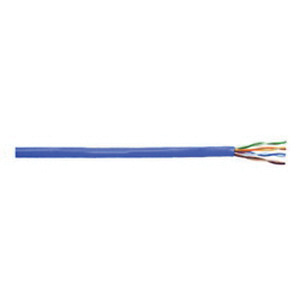 Superior Essex 10Gain® 23/4P CMP Plenum-rated Cat 6A cables has blue low smoke PVC jacket to withstand harsh environmental conditions. The colortip light brown/brown fluorinated ethylene propylene insulation resists electrical leakage and offers protection against environmental threats. Annealed copper cable has 100% spiral copper tape shielding that reduces EMI/RFI interference/crosstalk. This cable has outside diameter of 0.295-Inch. It is suitable for Power over Ethernet, ATM and token ring applications. This 1000-ft cable comes in a plywood reel. Cable is UL listed, CSA certified, RoHS/REACH compliant and meets NFPA 262, ANSI/TIA-568-C.2, article 800 standards.